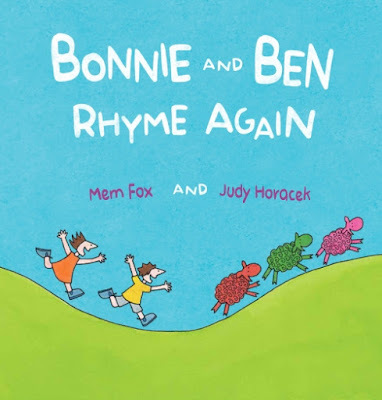 Bonnie and Ben Rhyme Again is a children’s picture book written by Men Fox, illustrated by Judy Horacek and published by Omnibus Books (2018.) RRP: $Au 19.99 HB. Join Bonnie and Ben as they rhyme their way through the day...until a twinkle, twinkle, little star calls them home. From Mem Fox and Judy Horacek, the team behind best-selling classics including Ducks Away, This and That and Where is the Green Sheep? We first met Bonnie, Ben and their friend, Skinny Doug, in the children’s picture book Good Night, Sleep Tight, also by Men Fox and Judy Horacek. In Bonne and Ben Rhyme Again, the two children go for a walk with Doug and they encounter all sorts of things that prompt them to think of nursery rhymes they know by heart. A hill? Jack and Jill of course. A sheep? Quickly the children recite Little Bo Peep. I am sure real children will use the words and illustrations as “clues” to the nursery rhymes that follow, and I love that Fox has built this element of play into the story as well. I love, I love it! Can you tell me another? and I just know families will adopt this refrain for their own nursery rhyme recitations. Men Fox has long encouraged parents to read and share nursery rhymes with their little ones, so my adult head enjoyed the reinforcement of this precept found in Bonnie and Ben Rhyme Again. As well as the classic nursery rhymes, Fox has written the story rhythmically and with her own rhyme, making this an excellent picture book for kids to memorise and “pretend” read. Horacek’s brightly coloured and cartoonish illustrations are perfectly pitched at children 2-8.